FeedTacoma readers, you have put up with my opinions on rain gardens, urban development, best restaurants and minimum wage. But there is something superior to political debate and discussion, something even more dear to me than efficient stormwater processing: poetry. It may not be the first time poetry is shared on this site, but this is the first time I'm sharing my poetry online. Also, I'd like to invite FeedTacomans to the History Museum this Sunday, April 29, at 2 pm. Cost is $6. More info here. I'm reading with five other local poets in celebration of National Poetry Month. The curator will be on hand to share some words on this excellent exhibition of Great Depression photos and artifacts. See kids tramping for jobs in Auburn, riots in Seattle, and the burning of the floating shantytowns of Tacoma! The wall of Ron Ginther primitive artwork (plus his notebooks and sketches) alone is worth the trip! At 3 pm poets read. 4 pm is a book-signing. 5 pm is an after-party at Anthem Coffee next door. I wrote this poem after one of my many drives down Fawcett Avenue. I'm totally fascinated by Fawcett! This poem was included in a hyper-local, limited-edition poetry book I produced with Tacoma poets for the Art Bus/Art Walk last week. wait for shy CBD gentlemen callers. three city blocks with a torch of domesticity. Downhill, graffiti garage pops, locks, spins. to export our best apples and glass? a Newfoundland on 6th Ave? April wind tousles his dog’s coat. to a cloud of smoke. If you have any links to history about Fawcett Avenue or Japan Town, or any stories, I'd love more info. I spent an hour driving around that area today. It's trying to say something to me! Also I'm very interested in the Yamane and Hirose families. 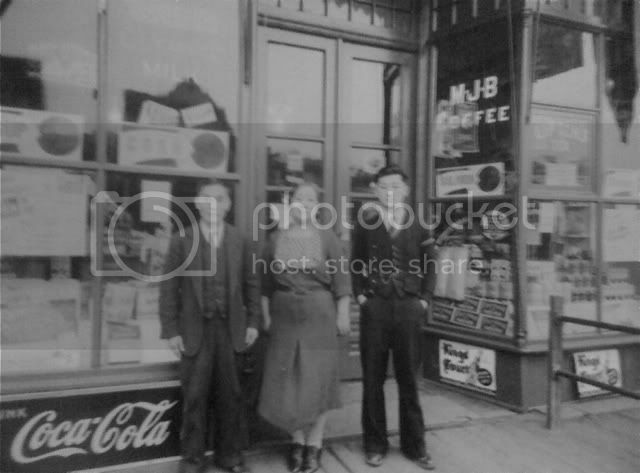 There is a beautiful photo of them in the exhibit in front of a grocery store in 1936.
by CaptainBritton on 4/23/2012 @ 9:15pm I'm not sure it's Uwajimaya, but they started in Tacoma too...I didn't write that poetically. by Marty on 4/23/2012 @ 11:19pm UWT has been working on a memorial for the Japanese language school that was inside the footprint of UWT. They have been working with members of the community and may be able to conect you to the info you seek. by fredo on 4/24/2012 @ 8:48am Good luck with your research and your poetry Maria. Your postings are a key feature of feedtacoma. No, I don't know where your picture was taken but I would guess Pacific Avenue or perhaps Tacoma Avenue. by Maria on 4/24/2012 @ 1:41pm @CaptainBritton I found a map at UW Tacoma last night that shows the original Uwajimaya. It was on Broadway just south of 15th Street where the Convention Center is right now. @Marty Thanks, I went there last night for three hours. UWT has a lot of resources, including quite a few interviews. I found an amazing (!!!!!) book about the almost ten city blocks of Japan Town in Tacoma, from the turn of the century until Internment. I discovered that my Fawcett Avenue was the center of the residential district. You can still see the concrete steps of some of the homes of the city's Japanese citizens. @Fredo I'm going to keep looking at storefronts. It may have been torn down. Most of Japan Town was razed. 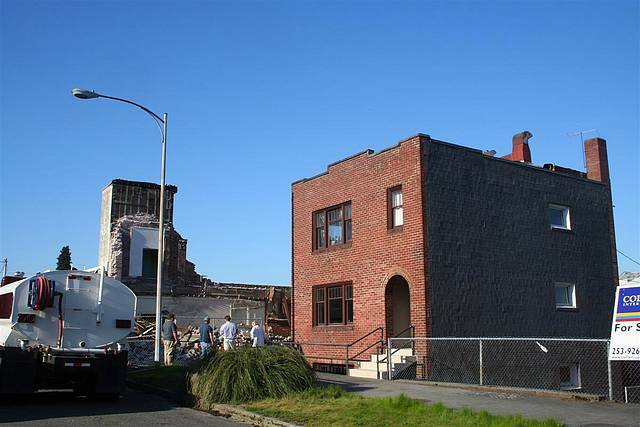 Pretty much all those vacant lots around Fawcett and Tacoma Ave. were Japanese homes or businesses that fell into disrepair after WWII when only about 150 of the original Tacoma Japanese-American residents returned to the city after years in the desert camps. Tacoma Mayor Harry Cain, however, was the only West Coast mayor to oppose internment. by NineInchNachos on 4/24/2012 @ 1:55pm Go Maria! by CaptainBritton on 4/24/2012 @ 1:59pm Thanks Maria! by Maria on 4/24/2012 @ 2:57pm Anyone know anything about this building? by NineInchNachos on 4/24/2012 @ 3:06pm it's all alonesome. cursed urban renewal ! by fredo on 4/24/2012 @ 3:09pm Maria, when I moved to Tacoma in the 1970s there was a little old Japanese lady who lived on Tacoma Ave (w side of street) just up the hill from the Heidelberg Brewery who sold little bonsai trees to passers by. I had one of her trees for a few years. by Maria on 4/24/2012 @ 5:29pm @fredo Hmm, interesting. Someone probably knows who that was. That's exactly the area of Japan Town, also. Maybe she was a hold-out. @Kevin Thanks! I found some of your photos and some from various photo safaris documenting that area (thank God). There was a video of the tear down of the Eagles building also on Exit 133. I can't find anything about Alex Russell, builder of said brave little red house, which is the red brick structure that inspired my poem. by fredo on 4/24/2012 @ 5:39pm The Japanese Language School could have been saved if they had kept a good roof on it and painted it. It was really a cool looking craftsman style building. It was nicely landscaped. Shame that it was demolished. by Maria on 4/24/2012 @ 6:41pm @fredo Yes, it was a beautiful and historic building. It sounds like it was in pretty bad shape, but around $3 million would have fixed it up. Too bad so many of these places are torn down rather than leased out cheaply. Activity and life of some sort seems better than overgrown weedy plots, fences, barbed wire and....the worst, parking lots. BTW, here's a photo of Japan Town at the corner of Thirteenth and Broadway, around 1940. They have a wealth of info online, including interviews (with written transcripts) of some amazing individuals who grew up in Tacoma...lots of anecdotes about Lincoln, Stadium, wandering downtown, etc. I was born in Tacoma, Washington, and I was born on September 25, 1917....We were living on Fawcett Avenue, which is about part way up the hill. Tacoma's very hilly. In fact, present-day Tacoma campus of the University of Washington is right on the borderline on the upper street of the limits of the campus, present-day campus, Fawcett Avenue. And that's where most of the Japanese were living, on Fawcett Avenue. Well, we knew that we were not going to... we didn't know, but they said that, "You should all assemble down at the foot of the Nineteenth Avenue," because that's where we had to take the train, Union Station. Well, that's when we kind of starting worrying, how come, to go to Puyallup, why are we taking a train? But anyway, we were all prepared with whatever we can carry and suitcase and everything, so we just left the front door and just didn't lock it or anything, just left. And we walked down the hill, it's about four blocks or so, kind of a fairly steep hill, but we walked straight down, and right into Union Station, train station. by fredo on 4/24/2012 @ 6:52pm Building on the left in your last posting has the same type of windows as the earlier picture you posted of the shopkeeper. by Jesse on 4/24/2012 @ 6:59pm Awesome thread BTW. Really enjoying it. Thanks for the pics and info Maria! by Maria on 4/24/2012 @ 8:13pm @Fredo -- Hmm, yes, well, very interesting. I think that's where the Murano is now, so I'll have to try to find other historical photos. @Jesse -- Thanks. I'm startled by this whole other world that existed right here, and that is mostly forgotten. Am I the only one who has never heard of this? 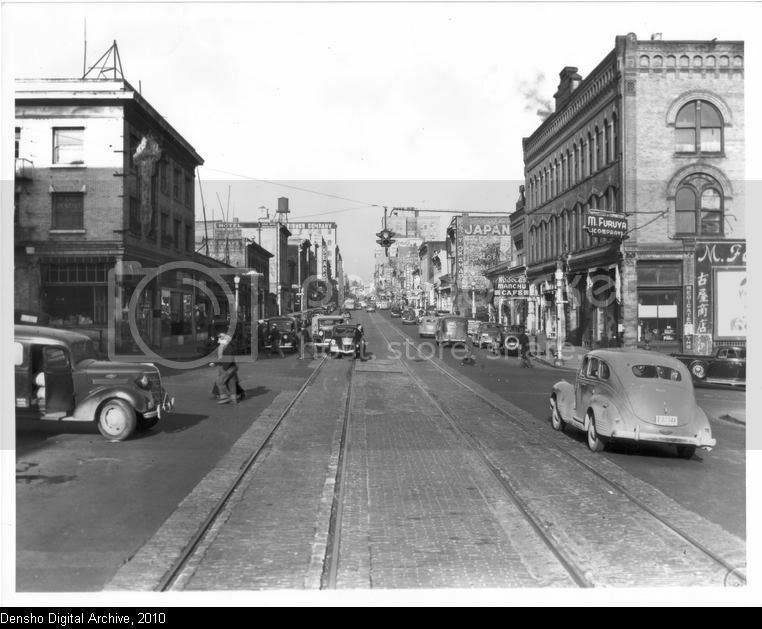 Is there anyone else who this is your first time hearing Tacoma had a huge, ten-city-blocks Japan Town in the 1930's? "export our best tofu and glass"
Here's another cool photo I found. The Tacoma Public Library is wonderful. "Rev. Jokatsu Yukawa, pastor of the Tacoma Hongwanji Buddhist Church, has donned protective gear and prepares to engage in kendo, a form of Japanese fencing. Rev. Yukawa is to the right in this sepia 1930's photograph; his masked opponent is not identified. 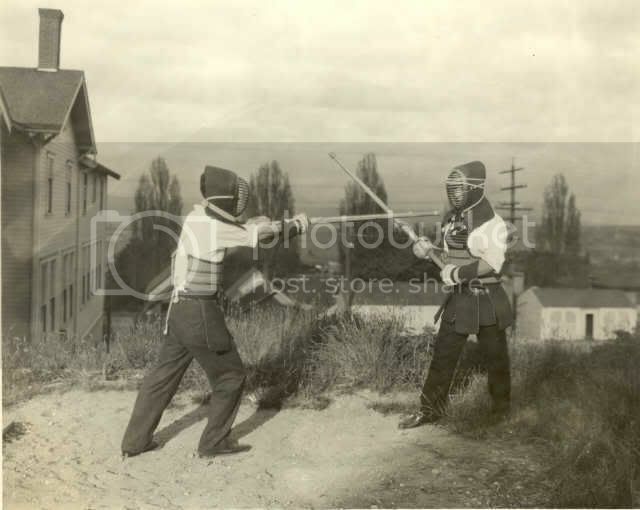 The pair are practicing at the site of the Japanese Language School on Tacoma Avenue South, which had opened in 1921." Come meet real actual poets! Imbibe free refreshments! 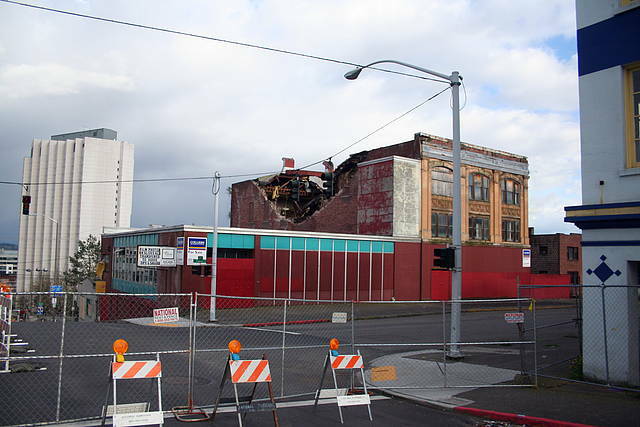 See photos of Tacoma burning and riots on the streets of the Emerald City. Find out why George Orwell said, "Language ought to be the joint creation of poets and manual workers." Hope some of you can make it! If so, please come introduce yourself so I can say hello. by Maria on 4/30/2012 @ 4:05pm This one stanza, for all the people of that time who claim to follow it, if they did follow and obey what they claim to hold allegiance to, if the people who stood before them in robes who teach from this book of poetry, had they recited it the Sunday before, and corrected their listeners, if a group of these people went down and stood with the Chinese, with this verse in their hearts willing to be immolated for it....this one verse could have stopped the madness/injustice. defend the rights of the poor and the needy." It's not that poetry is weak. People are weak and inconsistent. I am weak and inconsistent. by Jesse on 4/30/2012 @ 4:50pm Did you see the April 29 Seattle times insert on the local history of WW2 Japanese concentration camps? It's worth a read. It's like 6 pages long with many photos too. by NineInchNachos on 4/30/2012 @ 4:54pm activists backed up by poetry are revolutionaries. by Maria on 4/30/2012 @ 5:15pm @NineInchSushi That's why many political prisoners are sharing a jail cell with a poet. @Jesse No I didn't see that. Thanks for the heads up. Today (April 30) marks the seventy year anniversary of when the Japanese were taken from Tacoma. There were several waves of departures, into May. But today is the first day a group of American citizens walked down from Fawcett Avenue with two suitcases each. They had little time to sell or secure their property. Many didn't even own their businesses or homes because it was illegal for the older Japanese (born in Japan) to own property or a business. They often relied on the good graces of attorneys, neighbors and friends to hold their property deeds. At Union Station, they assembled under the watchful eye of military personnel with guns. The Japanese were dressed in hats, gloves, suits and dresses, most in their Sunday best. They arrived at Camp Harmony to find 3-4 inches of mud, hastily-erected facilities, hay-stuffed mattresses, communal latrines and single-room dwellings. Many moved to Seattle, where discrimination was less and there were more economic opportunities. Among these were the Moriguchi family, who had a truck selling food to workers, along with their tiny store on Broadway and 15th called Uwajimaya. by Maria on 4/30/2012 @ 5:23pm Does anyone have a copy of the April 29 insert Jesse was speaking of? I would love to have one to add to the materials I'm working on. Thanks in advance. by low bar on 4/30/2012 @ 6:22pm Poetry is nice and all. I've studied the Romatics, Blake, et al some are born to endless night....etc yes it adds to the discourse but nothing effects change like a having a law degree in your back pocket:) Someone vs Someone is how $hit gets done in a democracy. Poetry is just a way to be emo because you either can't afford to take someone to court or you didn't take the time to study up and pass a bar somewhere and work your way into government. Oh nevermind I didn't see that you found a use for divorcing politics from law making. My bad. by Maria on 4/30/2012 @ 6:53pm I agree with Dr. Martin Luther King, Jr.: "It may be true that the law cannot make a man love me but it can keep him from lynching me and I think that is pretty important, also." Poetry is more about love. It is about inviting a man to love someone else, something else, by speaking of its loveliness. Not necessarily an aesthetic loveliness, but its intrinsic and unique qualities that make it worthy of being adored. Tulips or brick buildings or a jazz musician. Love does a lot more to constrain people than law. But we absolutely need law (and lawyers) because some people will not love. Our justice system is also flawed, though, Low Bar. If you think poetry is a foolish endeavor, you've probably never sat through a trial. I considered going to law school myself, but I think I'm more of an artist at heart. Or a revolutionary. Mostly a good cook and gardener, though. by low bar on 4/30/2012 @ 7:12pm Nothing can be of more use to you in the reality we live in then a dual degree in law and economics. It doesn't make you any less capable of seeing beauty. It makes you a force to be reckoned with. by Jesse on 4/30/2012 @ 8:47pm @Maria: The article is in the Sunday paper, which can often be bought a few days later. If you want, I can bring it to Amocat and I'm sure Morgan would hold it for you until you can pick it up. by troysworktable on 4/30/2012 @ 10:54pm Poets are often some of the first people to be jailed when dictators seize power. Prophets and poets are thorns in the sides of kings. Truth is a difficult thing for power to withstand, so it is better to silence the truth. Keep up the good fight, Maria. Preach about poetry. Stand alongside your words. by Jesse on 5/1/2012 @ 10:00am @Maria: I will drop off the article at Amocat by 1pm today. by NineInchNachos on 5/1/2012 @ 11:04am "Our greatest strength is our powerlessness and our transparency"
by troysworktable on 5/1/2012 @ 2:03pm Vaclav Havel = poet + dissident + Czechoslovak/Czech president. Michael Higgins = poet + Irish president. Anna Akhmatova = poet + widow of activist killed during Soviet Communist purges. by low bar on 5/1/2012 @ 2:05pm NO, who from city council is going to be at the event? It's good you know your history, now the people in charge of you need to. by fredo on 5/1/2012 @ 2:06pm Maria I drove down Fawcett today to get a feel for the area. There are still a few buildings which probably go back to the ethnic Japanese era. There's a Buddhist Temple and another unidentified church building. Most everything old looks knocked down however. by troysworktable on 5/1/2012 @ 2:15pm low bar, your cynicism sometimes works and sometimes doesn't. Here it doesn't (at least for me). If your definition of poetry dwells only within " the Romantics, Blake, et al" and "stylish and eloquent fellow[s]", then I can understand why you may not be able to even allow for Maria's title/statement of "Poetry is Superior to Politics." by troysworktable on 5/1/2012 @ 2:19pm What about the blue collar poetry of Carl Sandburg? The lyrics of Bruce Springsteen, Johnny Cash, Woody Guthrie? Upton Sinclair's "The Jungle" exposed the meat industry and resulted in changes to the same. John Steinbeck? by NineInchNachos on 5/1/2012 @ 2:24pm Life is poetry. by NineInchNachos on 5/1/2012 @ 3:07pm whatever happened to warrior poets? by Maria on 5/1/2012 @ 3:39pm @lowbar -- Most poets are not stylish nor do we exclusively write about beauty or nature. I think the greatest service poets (and artists) provide the public is to create or interpret meaning. To write about things in a simple, honest way, so that when others tell lies, use cliche and manipulate, poetry stand aloof from that. Not to comment on beauty or coolness, but to dig into why things are. Truth, not beauty, is the subject of poetry. And if truth is important to societies, then poetry is important too. So the importance is in declaring truths and also in creating meaning out of eras, actions, decisions, tragedies, triumphs. A good poet might be able to sum up apartheid in ten lines. Ten lines written from a jail cell on toilet paper after torture. But just ten lines, so that the everyday person can read it and understand, and empathize. Short enough so masses of people remember a line or two. It might be passed along on illicit, illegal copies. The fact it was written in jail, after a beating, then smuggled out and now distributed, gives people hope. Here's a hero, beaten and disfigured, but he/she can't stop thinking and writing. They will write poetry at the risk of their lives, at the risk of further beatings. They warrior poets are in China, Egypt, Syria, even South Korea in past years under dictators and invaders. Now in saying this poetry is superior to politics, I don't mean good government, justice or law (all great and necessary things). I am not even saying it has more impact, because Low Bar, you're right, politics affects us more than poetry. But that doesn't make politics superior. Just more powerful. In my opinion, that way is rather flawed, noisy and inefficient. That system by which we choose our governance partly why we're in the mess we're in. If people would take more time to think for themselves (liberals and conservatives BOTH), if their poems weren't "baa baa baa baa / this is what our loudest sheep are chanting / so we're mindlessly repeating it," "two legs bad / four legs good" etc. -- then we may actually have a thoughtful political process that's not Svengeli'd by spin doctors and big money. So studying, writing, contemplating good poetry (and other great works of fiction and art) helps to create a healthy democracy that's able to govern themselves wisely and have the discernment to elect worthy leaders. That's just my theory. I don't think democracy can happen without a literate society of free thinkers. @Jesse -- thanks!!! I went to to places and no one had any remaining copies. @troyworkstable -- I agree with everything you said. @NIN they're on Game of Thrones? @troy you can be a politician and fix things or does your worktable not have that sort of inclination? its not like you have to be a demi god or anything. point is you share a world where not every single human born is going to be able to think for themselves or be as creative as the "poet" at heart. so there is always going to be a heavy political gravity, in fact the draw of politics in that sense will always be greater then poetry. may as well play the game. then again, if all sorrow and suffering were remedied all we'd have left were boring poems of pretty flowers so, HERES TO HARD TIMES. Meena lives in Gereshk, a town of 50,000 people in Helmand, the largest of Afghanistan’s 34 provinces. Helmand has struggled with the double burden of being one of the world’s largest opium producers and an insurgent stronghold. Meena’s father pulled her out of school four years ago after gunmen kidnapped one of her classmates. Now she stays home, cooks, cleans and teaches herself to write poetry in secret. Poems are the only form of education to which she has access. She doesn’t meet outsiders face to face. by troysworktable on 5/2/2012 @ 2:34pm low bar, Troy's Work Table states what it is right up front: "Books. Art. Beer." As for politics, I'm involved in Puyallup politics. I serve on the board of a city department and am active in my neighborhood and district. My wife is a member of the board of our local elementary PTA. In other words, my "worktable" is not so inclined, but I am. by troysworktable on 5/2/2012 @ 2:35pm And I claim no divine status, neither demigod nor higher. by low bar on 5/2/2012 @ 4:35pm Too bad about Meena, and too bad no one from city council is going to be at the event to perhaps get inspired to do a better job in 'hard times'. Phoenix Jones ’ll be all around in the dark. Phoenix Jones ’ll be ever’-where – wherever you can look. Wherever there’s a fight so hungry people can eat, Phoenix Jones ’ll be there. Wherever there’s a cop beatin’ up a guy, Phoenix Jones ’ll be there. Phoenix Jones ’ll be in the way guys yell when they’re mad – Phoenix Jones ’ll be in the way kids laugh when they’re hungry an’ they know supper’s ready. An’ when the people are eatin’ the stuff they raise, and livin’ in the houses they build – Phoenix Jones ’ll be there, too. by Mofo from the Hood on 5/3/2012 @ 9:17am In view of the emphasis on moving Japanese to internment camps, that historical act was decreed by radical democrats. In today's "Occupy" movements, we can witness similar types of people guided by socialist ideals--"For the benefit of the many"--people who gather together and plan ways to steal from others, ultimately for their own self-indulgence, in the name of Public Service. by troysworktable on 5/3/2012 @ 9:23am Mofo from the Hood: Which is worse: the Occupy movement "stealing" from others "for the benefit of many" or the Democrat/Republican corporate elite stealing for the benefit of themselves? by NineInchNachos on 5/3/2012 @ 9:24am you know who liked poetry too? HITLER! by troysworktable on 5/3/2012 @ 9:27am NineInchNachos: But Hitler wasn't fond of poetry and/or art that he associated with those he considered inferior—Jews, blacks, Eastern Europeans, Communists, homosexuals. Remember those book bonfires? so true even today. Thanks for the reminder sir! by NineInchNachos on 5/3/2012 @ 9:34am poets and cartoonists. kindred hunted spirits through time. "The HUAC, McCarthyism, and Witch-Hunts Through Captain Marvel Comics"
"Fredric Wertham - Anti-Comics Crusader Who Turned Advocate"
by Maria on 5/3/2012 @ 12:29pm One of the South's most loved writers, Flannery O'Conner, was earlier in her life a journalist, poet and CARTOONIST for her college newspaper and yearbook. She produced her weekly cartoon on linoleum, in those days before Illustrator and Photoshop. If anyone went to the reading at PLU last night, they would have seen a very powerful meeting of poetry, art and thought. Washington State Poet Laureate Kathleen Flenniken read from her new book, "Plume," which speaks on her hometown of Richland and the Handford facility. Her final poem was about the archeologist Handford hired (on the same team as former engineer Flenniken) who was instructed to produce a sign--a bunch of signs--that could be placed around the nuclear facility. So that ten thousand years later, another civilization would be able to decipher the words, the code that say, Stay away. This is a place of death. The PLU printing program students created a commemorative letterpress print of that final poem, and it's stunning in its simplicity and the way it captured the gravity of the poem. 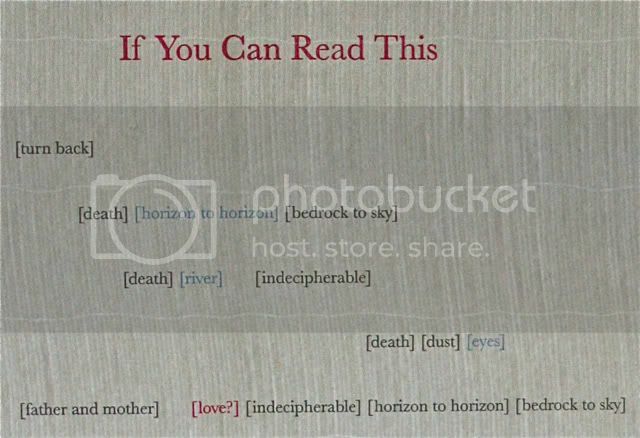 The form of the print advances the meaning of the poem.